How do you fancy becoming a lift designer expert who has full control over how your lift functions and looks? You do? Excellent! 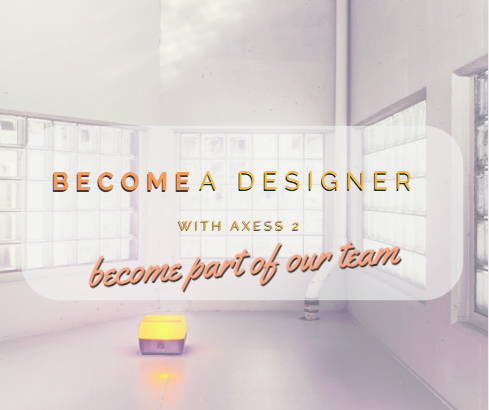 The good news is that our lift specialists here at Axess 2 welcome the help of our customers, especially when they are looking to create bespoke access lifts in their home. 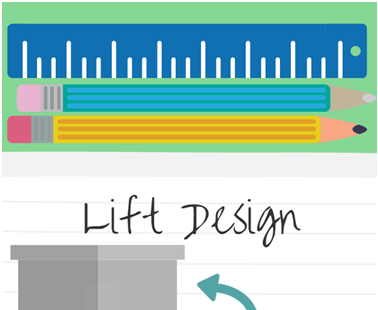 Don’t be put off, after spending just a few hours with our experts, you’ll be part of the lift design family! So, how can you go about creating your own personalised lift for your home? 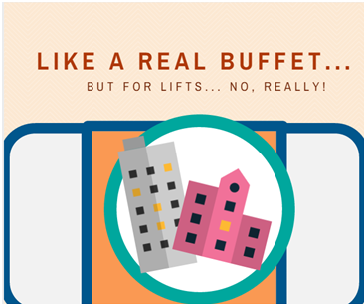 We like to think of our lift creation process as a buffet… but with lift parts. Everyone likes food, and a buffet isn’t really that hard to navigate- you simply pick the bits and pieces that you want and leave anything that doesn’t interest you. Building a lift is no different, really… you just don’t get to eat all the delicious food that you pick, you assemble it into a useable, helpful system that can make getting around your home much easier and a whole lot more comfortable. Continuing with this buffet idea- we’re hungry, okay! Building and installing lifts is hungry business – where do you normally start your picking process? In the middle? Never! The most sensible place to start is at the top of the table where the plates are. Before you begin picking as many pieces as you can and putting them on your plate, you will first have to judge how hungry you are. In lift design terms, this means working out exactly what you require your lift to do. No, we don’t just mean “go up and down my building”- although that does come into it, which we will go on to talk about in a minute. 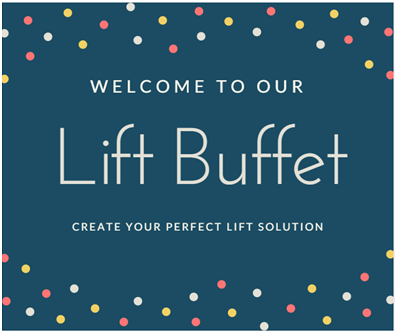 Deciding how you want your lift to operate and look before you begin the picking process from the buffet is the best way to start off on the right foot and avoid issues when it comes to putting the design together completely at the end. How Much Do You Really Want? Once you’ve decided how you want your lift to look and move, the first thing to decide on is how many floors you want the lift to ascend or descend. Is your house only 2 storeys high, or do you want to have a lift that descends to the basement below your ground floor, too? Deciding this will determine how many floors you can travel between. This is where our lift structures come in; we have varying heights and floor levels for you to choose from, so all you need to do is let us know how many floors you want your lift to cover and the height this distance measures! 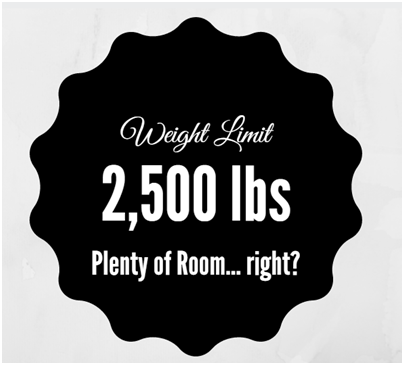 We like to think of this as determining the minimum and maximum amount of food that you’re going to eat from the buffet. You don’t want to overstretch and plan too many floors when you don’t need to, but you need to make sure you’re planning for enough to make your lift of use. Although this might seem like a sensitive subject, the next thing that you will need to consider is the weight that the lift will be carrying. We don’t just mean your weight, and your weight alone; you will need to consider other factors which may affect the amount of weight in the lift, such as a wheelchair or other heavy, essential objects like oxygen tanks. We don’t want the lift not being able to function properly, so it’s important to give a realistic figure when designing it. This will affect the machinery that operates the lift, so we need to make sure we’re working together to get it right! This is the moment you’ve been building up to- the main event! 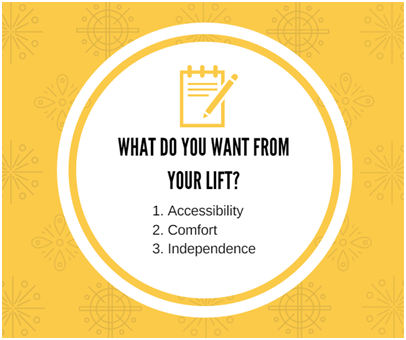 You’ve probably already got an image in your head regarding how you want your lift to look- at least, we’re hoping that you do at this stage of the process! This bit is quite possibly one of the easiest parts of the process for designers, especially if there’s a strong theme or look that you want to achieve with your lift. Maybe you want to keep the modern look of your home with a beautiful scenic glass lift, or maybe you’re afraid of heights and would prefer a more enclosed cabin to travel in. Whatever you decide, we have a wide variety of options that you can adapt or change. 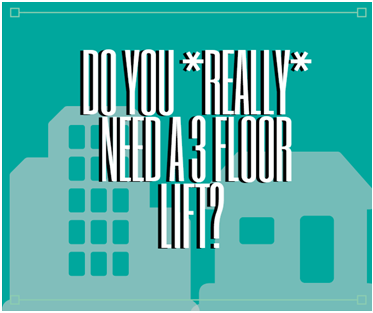 That’s right, you are completely in charge of how your lift looks! From the overall style right down to the buttons, displays and lighting that are used, you are the one making all the executive design choices…we guess that means that you’re the boss! Before the power goes completely to your brain, you must understand that there are many different design decisions that you will have to make before your lift can become a reality. Door width, door hinge position, cabin and landing operation controls are all important decisions that need to be established at this point. The moment of truth is quite possibly the most exciting part of the process, and also the most nerve-wracking for many designers. Don’t worry if you’re feeling a little bit tense after handing over your design choices to the installation team in preparation for your lift being installed in your home. Working to your specifications, our experts will begin constructing and installing your lift, exactly how you want it. We like to think of this part of the process as being the host of a party where the buffet is served and your nerves start to kick in. Did you really make a good decision by adding the scotch eggs? Is the interior really the colour you want? Relax! You’ll have the support of our entire team who work with you every step of the way, making sure that the decisions you are making are really what you want. And that’s our lift design process! It’s not that difficult to follow really, which is why we love involving our customers in the process, too! We hope you’ve found this breakdown of our lift builder service useful! If you would like to find out more information about how we can work alongside you to create the most suitable lift system for your home or business, don’t hesitate to contact us today on 01200 405 005 or follow us on Facebook, Twitter, Google+ and YouTube!